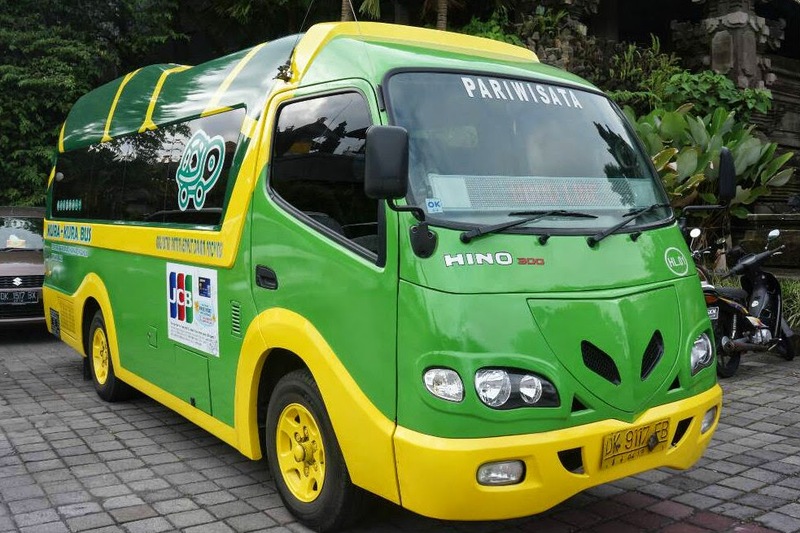 Although it considered as a new public shuttle service, but Kura kura bus already has 8 routes around Bali and mostly on central and south Bali ; Kuta line, Legian Line, Seminyak Line, Sanur Line, Jimbaran Line, Pecatu Indah resort line, South Nusa Dua line and Ubud Line. They next route will be Nusa Dua line and it will launch soon. Most of the bus stops are well known hotel, so if you will stay at one of the hotel that has kura-kura bus stop you can easily wait for the bus on the lobby or you can walk to another destination that reachable from the hotel. Psst several famous places and 5star hotel become kura – kura bus partner such as: Waterbom Bali, Seminyak Square, Ayana resort, Le Meridien, Grand Hyatt and many more. Kura-kura bus time table has a lot of bus schedules for a day. For Kuta and Legian line, Kura-Kura shuttle will arrive every 30 minutes, (well except for traffic hour). For another line, shuttle has schedule from 4 up to 11 times daily. If there's any issue on some line, they will inform the passengers via twitter or other social media account or you can directly ask to kura-kura staff in ticket booth. This is the most important thing that's why I chose this service. Each line has a flat fare for a single journey, all line excluding Seminyak Line connect through Galleria DFS Bus Bay. For Kuta, Legian and Seminyak Rp 20.000, Sanur and Jimbaran Rp 40.000, Pecatu Indah Resort Line and South Nusa Dua Line Rp. 50.000 and Ubud Line Rp. 80.000. They use a coin in different colors for each amount. For multiple trips on all line you can also choose Value card, there are 100k, 200k, 300k and 400k cards. You can also topup this value card from 100k up to 500k on Dfs bus bay or ticket booths. For unlimited travel on lines, you can choose Day Pass like we did. We chose 3 day pass simply because I just have 3 days left that day LOL. 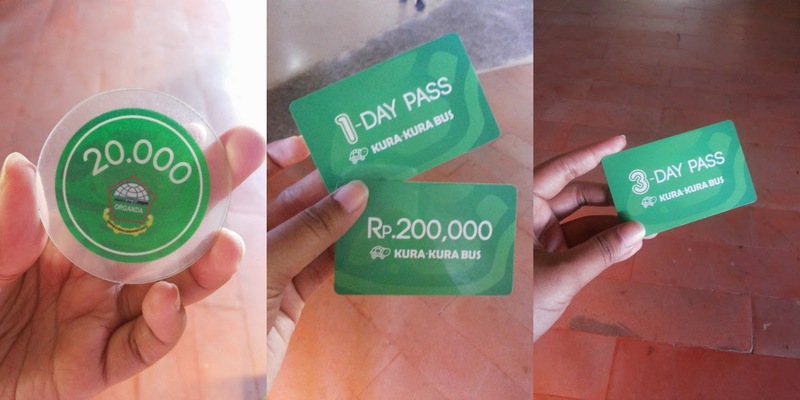 There are 1, 3, 5 and 7 Day Pass available on Kura-kura bus. One day is calculated 24 hours from the first time you tap the card into the device. Dont forget, they also have 20K refundable card deposit. Choose your payment wisely, if you only need a ride to your hotel, you better choose the single trip coin. 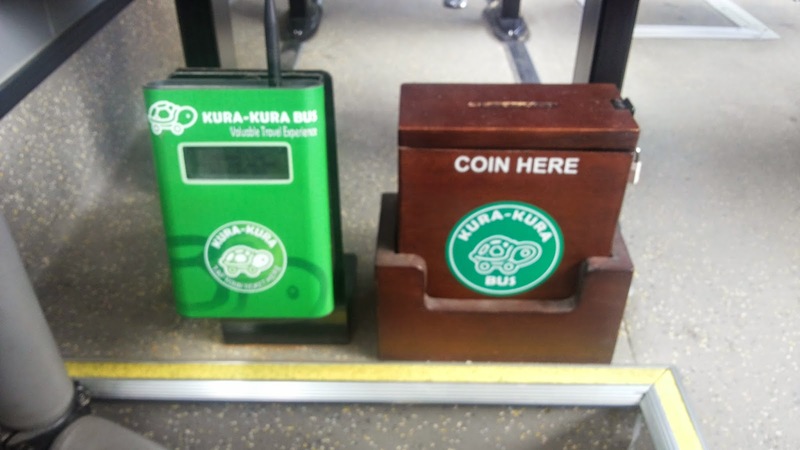 There are 3 types of bus on Kura-kura bus service. Medium bus (29 seats), Long mini bus (15 seats), and short mini bus (12 seats). Hey look at their eye catching shuttle service design, turtle on the road! Kura-kuba bus has several onboard facilities, such as; Wifi, Electric power socket, LCD video and Audio voice announcement system for route and bus stops info. For solo traveler or duo traveler this service is really worth it and useful, moreover for a restaurant hopper like me and Sharon did. Fyi, a taxi fare from Kayu Aya (Seminyak) to Our hotel in Kuta was around 60K one way and if we did this almost every time then I don't think my money would be enough for airport tax payment and Damri Bus on my way to home hahahahah. 1. Make sure you arrived about 5 to 10 minutes before the schedule to prevent you from missed the bus. 3. Somehow their normal seat didn't comfortable for a long journey trip, so if you travel to Ubud better you take the rearmost seat for a better seat. 4. Ask the driver if the electric socket didn't turn on. Last but not least I have to say thank you to Kak Nathalie, she was the first person who introduced me with this service. hi mei. salam kenal.. wahh. seru bngt yahha ada si kura2 bali ini.. kalau dari airport gt, belum ada yah? since they only put DFS bay gt di map.nya.. hehe..
aaaakhirnnyyaaa bali ada transportasi kece beginiii. Satu lagi pertanyaan ini shuttlenya on time ga? aduh kemarin di bali mau nyobain ini pegel nungguinnya bok, akhirnya balik lagi naik Bluebird ajah lagian deket2 juga jaraknya. ahhahah iyah kak, dibeberapa line dia ada jam-jam tersendiri tapi kalo Kuta, Seminyak sama Legian sih setengah jam sekali kok. Kok gue nggak pernah liat yak ._. wahh. seru bngt yahha ada si kura2 bali ini.. kalau dari airport gt, belum ada yah? Hahahahha.... kalau ke bali naik travel kira-kira butuh biaya berapa? Payment devices nya... kfreatif banget.... sumpak keren..
Thx infonya sis, cuma sy mau tanya itu rutenya misalnya Kuta-Legian-Seminyak coinnya RP 20.000, itu maksudnya Rp 20.000 sudah all in 3 rute tsb atau masing2 pemberhentian 20.000 yah?